Once upon a time, there was a chef from Atlanta who became a contestant on Bravo's "Next Top Chef." Though Richard Blais did not win "Top Chef," he did make an impression with his molecular gastronomy, and his new found celebrity is serving him well as Creative Director of Flip Burger Boutique in Atlanta. Blais has developed a fun menu with an assortment of flavor profiles that are bound to please. Tonight a group of friends decided to try out the new ATL hot spot, and at best it was a mixed bag. The food was good, but the kitchen was in the weeds, and the service was unworthy of the 18% gratuity our group of six was forced to pay per restaurant policy. Let's be fair and start with what was good. First, they told us the wait would be 45 - 50 minutes and then seated us after only 30 minutes. Blais' creations really are the stars of the show here. 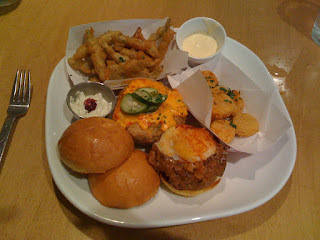 Whether it is the assortment of traditional beef burgers composed of sirloin, brisket, and short rib (like the country fried burger with pimento cheese and green tomatoe catsup) or the less traditional burgers (like my chorizo burger covered in manchego cheese and a perfectly runny fried egg), these are five ounces of fun for your mouth. The milkshakes, made with liquid nitrogen, are a fun throw back to a bygone age. 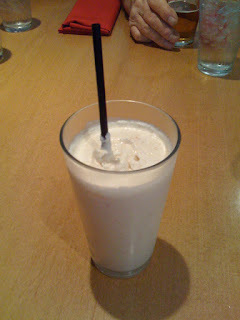 The Krispy Kreme milkshake arrived smoking from the bar, and as advertised it tasted like my favorite glazed donut. The room's design was modern and hip. Unfortunately, thus ends the better part of our dining experience. Though there are more employees walking around in this joint than your average Walmart, I was never quite clear on the division of duties, except for the waterboy who seemed to fill every glass in the place on a regular rotation. There was our waiter, the biggest disappointment of the evening, whose drive by style of addressing us made me feel as if he had something better to do. Mostly he walked by to tell us something like, "Your food will be up in a minute," but he never really stopped to talk to us. After leaving it to one poor food runner to deliver all of our meals by herself, he showed up to start clearing plates at the end, reach across my plate to clear my neighbor's, then started to clear mine, when I was not finished. As bad as the wait service was, the kitchen and bar service was not much better. after our drink orders were put in (three beers and two milkshakes), the beers were delivered sloppily, with one beer practically sloshed on one person (there seems to be a rule that trays can only be used for clearing tables, not delivering food or drinks), and our milkshakes were no where to be found, and neither was our waiter. He did drive by to say the milkshakes would be up soon, but he didn't stop to take our food order. When our food did finally make its way to out table(eight burgers and six sides), it did so in stages, with one person's meal arriving a good five minutes after everyone else's meal. Once again the waiter was MIA, until he delivered the last burger with a smug look like he had just done us a huge favor. Not only were the burgers fashionably late but many of them were less the hot upon arrival. The sides were equally cool, except for the sweet potato tots, which were filled with plenty of hot grease and topped with more salt than my cardiologist would normally recommend. This is unacceptable. Many people will say that my expectations are too high for a burger joint, and I should not be so incensed. I disagree, because any restaurant that calls itself a boutique and hires a celebrity chef to be creative director who specialty is molecular gastronomy has pretentions to something more than a burger joint. 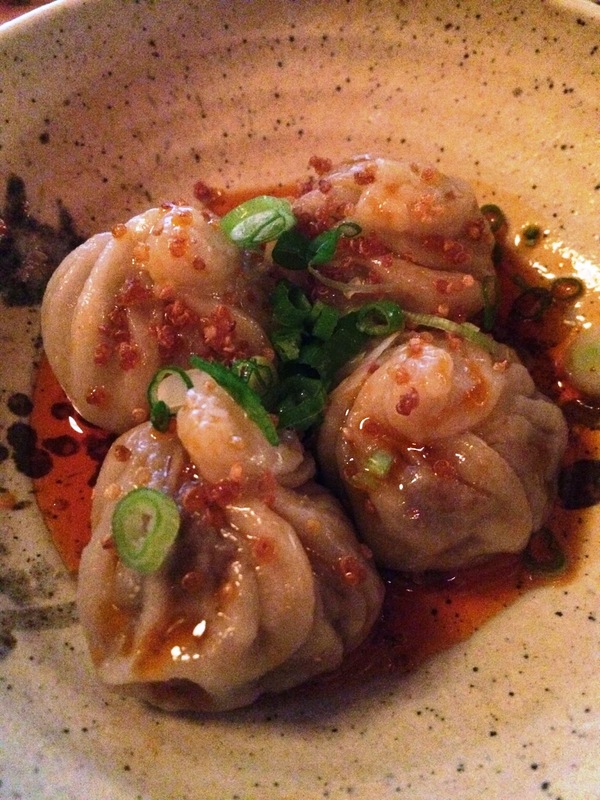 If Flip wants to be a real foodie mecca, and not just the flavor of the week, then the service has to be better. Yes, the lemmings will continue to come, but all the buzz will only last until Blais decides he's bored here too, or the next hot new place opens up across town. Then, Flip will fade just like all the others, because it is missing the solid foundation of good wait service and kitchen precision.